Iron is an essential mineral in our bodies. The recommended dietary allowance (RDA) is between 8mg and 18mg per day. Beef is an excellent source of iron. 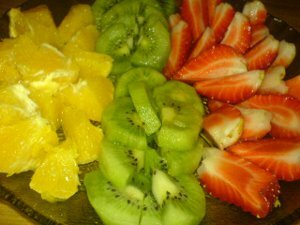 Drinking fruit juices high in vitamin C, such as orange or kiwi or strawberry, with a meal helps you absorb iron. Iron is an essential mineral in our bodies. It is needed to carry oxygen from our lungs to every cell in our bodies. The full dietary allowance for all ages is shown in the Data Zone. Very high doses of iron can be toxic. Almost two-thirds of our bodies’ iron is in hemoglobin, the oxygen-carrying protein in red blood cells. Iron is also found in myoglobin, a protein that helps store oxygen in our muscles. In addition to its vital role in oxygen movement and storage, iron is also is needed to regulate the growth and differentiation of our cells and for our immune systems to function. Iron deficiency is the most common nutrient deficiency in the Unites States. A lack of iron leads to anemia, which causes tiredness and a lack of energy. Plant and meat foods can be a good source of iron. Iron from meat (heme iron) is more easily absorbed than iron from plants (nonheme iron). Iron is absorbed in our intestines; absorption is greatly improved by taking vitamin C. Some foods, for example dark leafy greens, contain both iron and vitamin C.
Eating meat boosts iron absorption when we eat leaves and vegetables. You can see a list of foods that are high in iron by scrolling a little farther down this page. The list shows the amount of iron in a standard portion and also the percentage of recommended daily allowance. Foods that are particularly high in iron, and common foods that have a useful amount of iron are included in the list. For example a large handful of raisins provides for 5% of your daily value. "Foods High In Iron." Chemicool Periodic Table. Chemicool.com. 11 Feb. 2013. Web.